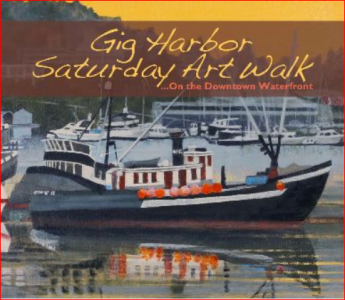 Join us every First Saturday along the Gig Harbor Waterfront for the monthly Artwalk. Check the Gig Harbor Artwalk Facebook page for activity and demonstration times. Pick up a passport at the first gallery on your walk. Look for the red tennis shoe flags flying at the galleries and businesses participating in the walk. Access the most current interactive map at http://bit.ly/ghartwalk. Hope to see you at our next Artwalk!